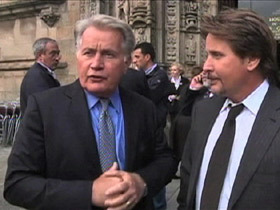 KIM LAWTON, correspondent: Martin Sheen says “The Way” is ultimately about a journey—a journey of the spirit as well as the flesh. WOMAN (in film clip): So what is it, on a pilgrimage to change your life? TOM (in film clip): Something like that. 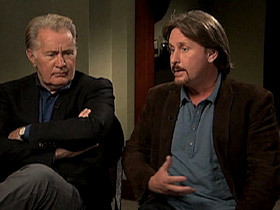 MARTIN SHEEN: All of our journeys are personal, deeply personal, and they’re all mysterious, you know. We’re all looking for that transcendence, but we’re looking to each other, and we identify with each other. I think the genius of God is choosing to dwell where we are least likely to look, within the depths of our own being. DANIEL (in film clip): If I don’t have your blessing that’s fine, but don’t judge this. Don’t judge me. TOM (in film clip): My life here might not seem like much to you, but it’s the life I choose. DANIEL (in film clip): You don’t choose a life, Dad. You live one. LAWTON: The story centers around Sheen’s character, Tom, a doctor who has a strained relationship with his free-spirited son, Daniel. Daniel dies in a freak storm in Europe, and when Tom goes to collect his remains, he discovers his son had been walking the famed 500-mile pilgrimage across Spain known as El Camino de Santiago—The Way of Saint James. MAN (in film clip): We believers are told that the remains of Saint James, the apostle of Jesus, are interned there, and so we make pilgrimage. This is what your son, Daniel, was doing. LAWTON: Grief-stricken, Tom decides to finish the pilgrimage himself, sprinkling Daniel’s ashes as he goes. 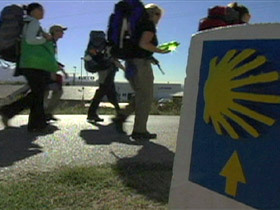 Along the way he meets three other pilgrims, and together they search for healing and ultimate meaning in their lives. The story was inspired by a trip Sheen took to the Camino several years ago, although he drove instead of walking. He came home and told Estevez they needed to do a project around it. Estevez wrote the script, casting his father, who is a practicing Catholic, against type. FATHER FRANK (in film clip): Are you a Catholic? TOM (in film clip): I don’t practice anymore. You know, Mass at Christmas, Easter, that’s about it. FATHER FRANK (in film clip): Here, take this. TOM (in film clip): No, I can’t take your rosary, Father. EMILIO ESTEVEZ: There cannot be conversion if you already start out being devout. Let’s open the film where you’re not even interested in praying with your parish priest, right? He’s reached bottom now. He’s a widower, he’s now lost his son. He’s totally alone in the world, he’s without family. His idea of community is, you know, playing golf with his fellow doctors at the country club, and so I needed him to be at that place so that by the time this character arrives at the end of the film, there is a transformation. He is awake. He is converted. 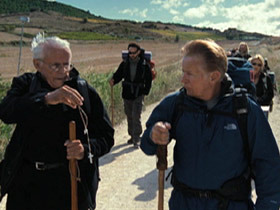 LAWTON: Sheen says his Catholic faith was strengthened by seeing and experiencing the rituals of the Camino pilgrimage and the Mass that takes place at the Cathedral of Santiago de Compostela when the pilgrims finally arrive. SHEEN: The botafumiero, you know, the incense ceremony at the end of the Mass, brings out a deeply moving exaltation from the congregation. They burst into applause, and many of them burst into tears. And, you know, the incense is an offering to God, you know, but it’s also an ancient tradition and ritual, and we don’t have a whole lot of ritual in our lives. You know, we’ve lost more and more of ritual just within our own family structures—evening meals, evening, you know, family prayer. So I think people are—they respond to ritual. It’s something that you can get reconnected with, in a way. You know, they’ve been doing that since the Middle Ages. LAWTON: And you had mentioned earlier just with pilgrimage, the sense of the physical, the flesh and the spiritual coming together. How did you see that, especially there? SHEEN: Well, you know, pilgrimage is kind of a demanding struggle. It must be to take you out of your comfort zone. So you go to a place, whether it’s Mecca or Santiago or Tibet or Rome, Jerusalem, wherever it is—you’re seeking something, and you’re going to have to do it on your own. Nobody can carry your pack. Nobody can walk in your shoes. You must do it alone, but you cannot do it without community. LAWTON: The difficulty of the journey, he says, touches the soul. SHEEN: You begin the journey within. Now the real pilgrimage begins, because now you have to open up the dungeons and jail cells of your heart and release all of the things that have been keeping you from being yourself, keeping you from, you know, discovering who you really are. So you let go of your resentments and your anger and your jealousies and your hatreds and all the dark parts, and eventually you’ll become free, you’ll become yourself, and you’ll become part of your extended family, which is community. ESTEVEZ: And sometimes that family and those people you pick up along the Camino are not necessarily people you would choose. They choose you in many ways, and yet those are the people that we sometimes learn the greatest lessons from. LAWTON: Estevez describes his own spiritual situation as still evolving. ESTEVEZ: I’m what my mother likes to call a work in progress. My parents—I grew up in a house where my parents differed on what religion was all about. She was raised Southern Baptist, wasn’t allowed to see movies or dance. It was very, very strict. He was raised a devout Catholic. SHEEN: We sang and danced all the time. ESTEVEZ: So as a young boy—I was baptized Catholic, but all I heard were arguments about religion. There was no talk about spirituality. So I sort of had to take a step back from that. LAWTON: He says this film has opened him up to new spiritual possibilities. ESTEVEZ: I think it’s an example, a shining example of where I’m at right now in terms of my spiritual path, the path I’m on. SHEEN: Are you saying there’s a chance you could become a Catholic? ESTEVEZ: I’m just saying there’s a possibility of everything. I’m open to the possibility of absolutely everything. SHEEN: Okay, I’m just asking. We don’t get this opportunity. JACK (in film clip): So far, there are some 15 percent say they are doing it for health. Fewer than 5 percent say they are actually looking for a miracle. TOM (in film clip): Miracles are in short supply these days, Jack. LAWTON: Despite the setting and themes, the film’s religious messages are subtle. Estevez says he didn’t want to hit people over the head. But they have been marketing “The Way” at special screenings for Catholic groups—and for evangelical audiences, too. LAWTON: What’s been the reaction of the church, the Catholic Church? ESTEVEZ: Amazing. Yeah, amazing. Across the board. And it started in Spain. You know, we screened the film in, opened the film in Santiago. We were there for the pope’s Mass last October, and then two days later we screened the film for the archbishop of Santiago and the government of Galicia, and we were sitting in a little tiny box in a 200-year-old theater, and we were sweating because we were so nervous about how they would react. SHEEN: They were the first audience. SHEEN: They were very relieved, basically. 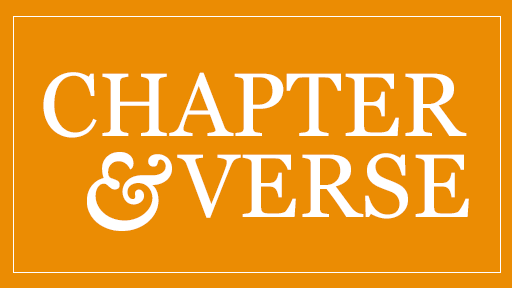 ESTEVEZ: And so were we. LAWTON: They say they hope their audiences get as much out of this project as they did. SHEEN: Whatever the audience takes away is going to be their gift, if you will. We offer this gift. If they accept it, we’re delighted. ESTEVEZ: We don’t impose our Camino on anyone, but we say get outside of yourself and join us on this journey.